When it comes to the appearance of your house, there’s always room for improvement, and one surefire way to truly upgrade that curb appeal is through the installation of siding. As part of a leading Cincinnati, OH-based home renovation company, the crew at Murphy Home Improvement has spruced up countless area properties this way, employing only the finest-quality materials. This makes them true experts when it comes to siding, and they’re more than happy to share their knowledge. Vinyl: There’s a reason this one is by far the most popular type. It is extremely durable and relatively inexpensive. Coming in a variety of colors and easy to maintain, this type of siding lasts up to 40 years and can be customized to the look of your home. Wood: There’s much to be said for the aesthetics of wood siding, and it’s durable as long as it’s maintained properly. This type does sometimes chip or crack, though, and it can start to deteriorate if it’s not painted or finished. 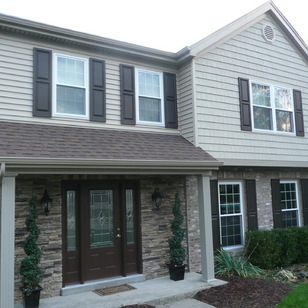 Brick: While this type will be on the higher end in terms of cost, brick siding is known for its gorgeous finish. However, the installation is a little more involved, and there is a risk of deterioration, so it’s a bit of a gamble. Fiber Cement: This type is ingenious because it mimics the look of stone or brick siding but is usually significantly less expensive. It’s inflammable and lasts up to 50 years, but there is always a risk of moisture problems. Stone: This type of siding, like brick, does involve a multiple-stage installation process, but the results are simply stunning. Just be aware that in order to get that gorgeous look, you will spend more than you would on other types of siding. Ultimately, in terms of bang for your buck, it’s hard to beat vinyl, especially with all the great new types out there. A representative of Murphy Home Improvement will be able to give you a more detailed account of what’s available and what could work. To learn more about these dedicated siding and remodeling leaders, check out their website, call (513) 922-898, or stop by their Cincinnati showroom today.